NVC is tool used widely throughout the world for creating connection and transcending differences, and is based in cultivating the capacity to sustain an understanding of our own and others’ feelings and needs – even in times of intense conflict. In this hour-long, interactive session, NVC trainer Lynda Smith will share the core principles and practices of NVC so that you can begin the journey of becoming a resource for peace in your own community. Every year, on April 19th, Project Laundry List joins together with hundreds of organizations from around the country to educate communities about energy consumption. National Hanging Out Day was created to demonstrate how it is possible to save money and energy by using a clothesline. Calling all Transitioners, homesteaders, teachers, cooks, gardeners, home-renovators....spread the inspiration and join us for the 350 Home & Garden Challenge. Sign up as a community organizer, and/or register your action — join us for our next organizer open call on April 5th at 11:00am PT to share your ideas, ask questions and get support. We’re thrilled at how this challenge is spreading across the country and internationally. 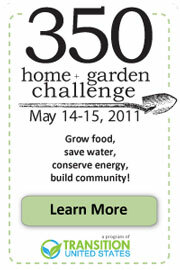 With just over six weeks to go, the response to this 350 Home & Garden Challenge has been wonderful with well over 30 organizers (that would be you) stepping up. The actions people are taking range fromplanting a fruit tree, torepairing a leaky faucet, to organizing 20 volunteers to create a school gardenor installing an array of solar panels at city hall. The important thing is that we all stand up and be counted. Visit our website to learn more -- We are also looking to expand our growing list of media sponsors, with 350.org, 4YearsGo!, Bioneers, Post Carbon Institute, and more already on board. This month we welcome the first official Transition Initiative in South Dakota and the 85th Transition Initiative in the US! Browse the initiatives map and learn more about becoming an Official Transition Initiative. Naomi Klein & Avi Lewis visit Totnes - community members convened over a weekend to listen to a presentation by Naomi Klein. Watch the video recaphere + Rob interviewing Naomi here. Transition Network 2011 UK conference: Dates have been set for 8 to 11-July in Liverpool - details here. Richard Heinberg presents on 'The End of Growth' - though we couldn't all be there in Totnes for Richard's presentation, it is online here thanks to the nuproject folk. Hooray for saavy documentation! In March PCI picked up the Best Video in the Small Nonprofit category in the YouTube DoGooder nonprofit video awards for our 300 Years of Fossil Fuels animation. Thousands of organizations participated and four were awarded the top prize. For this we are grateful and proud. Thanks to everyone who voted for us. March also saw the release of new chapters from Richard Heinberg's upcoming book The End of Growth and the Post Carbon Reader. Transition US is a nonprofit organization that provides inspiration, encouragement, support, networking, and training for Transition Initiatives across the United States. We are working in close partnership with the Transition Network, a UK based organization that supports the international Transition Movement as a whole.